Pocket Booth Lounge Seating creates an intimate space where you can work, hang out or eat. The contoured cushioned seating fits perfectly around a round table. Your choice of bold and beautiful upholstery covers high-density, upholstery-grade foam seats and backs. With so many great fabrics to choose from, you get the perfect combination of comfort and style. 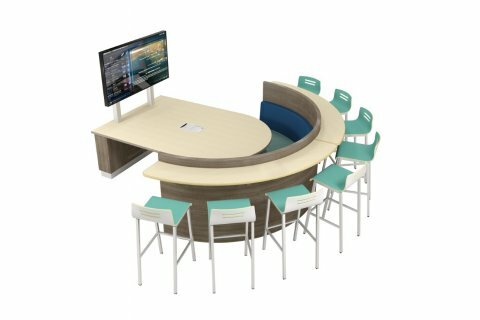 This booth seating will quickly become the best seat in the house, so it is built to withstand abundant use and enjoyment. 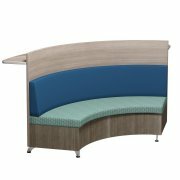 The back panel is made with multiple layers of wiggle board plywood, phenolic backer and laminate, while the bench assembly is constructed from engineered wood. 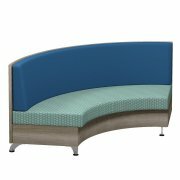 Plate steel leg assemblies with threaded nuts are built to withstand the test of time, so you will be enjoying this cozy, contemporary lounge seating for many years to come. Cushy Seat: High-density upholstery-grade foam cushions the back and seat. Sturdy Materials: Back panel has multiple layers of plywood, phenolic backer, laminate and wiggle board plywood. Strong Support: Legs fabricated from ¾" plate steel, with mounting plates and threaded weld nuts. Non Scratch: Black leveling glides keep surfaces straight and prevent floor damage. Power Option: Flat surface of bench base can accommodate a power/data module for accessible charging.